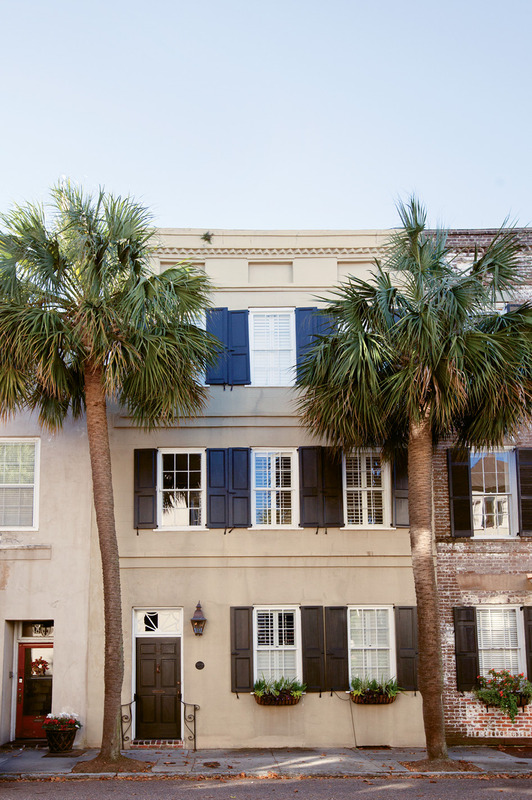 Come On In: Flanked by palmettos, the stucco-over-brick abode is the picture of Charleston charm. 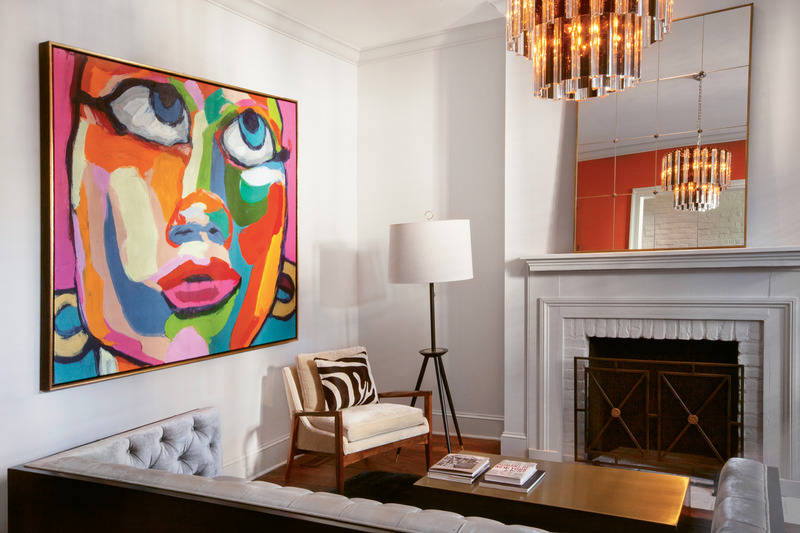 Balancing Act: In Dr. Eddie Irions’s living room, a few bold statement pieces—such as a colorful portrait by Brazilian artist Robson Reis Marques and an Art Deco chandelier—are grounded by a mostly neutral palette. 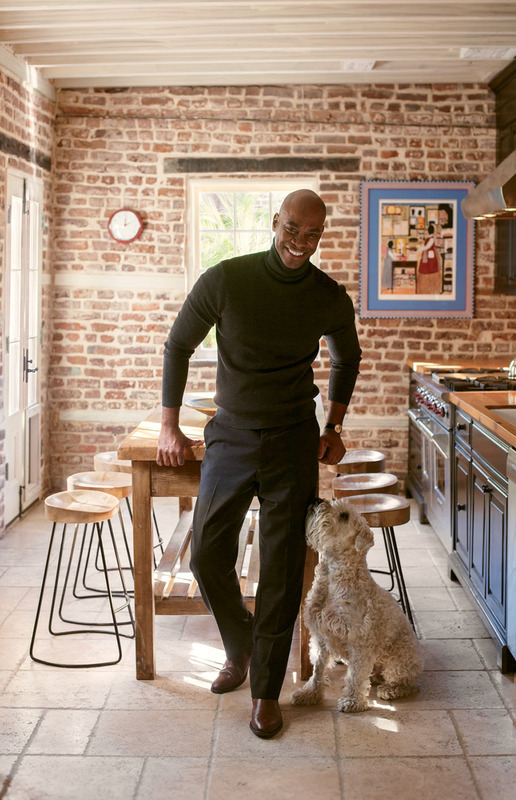 The physician, shown with his pup, Kasey, worked with interior stylist Nathalie Naylor to balance his love of modernism with the home’s traditional architecture. 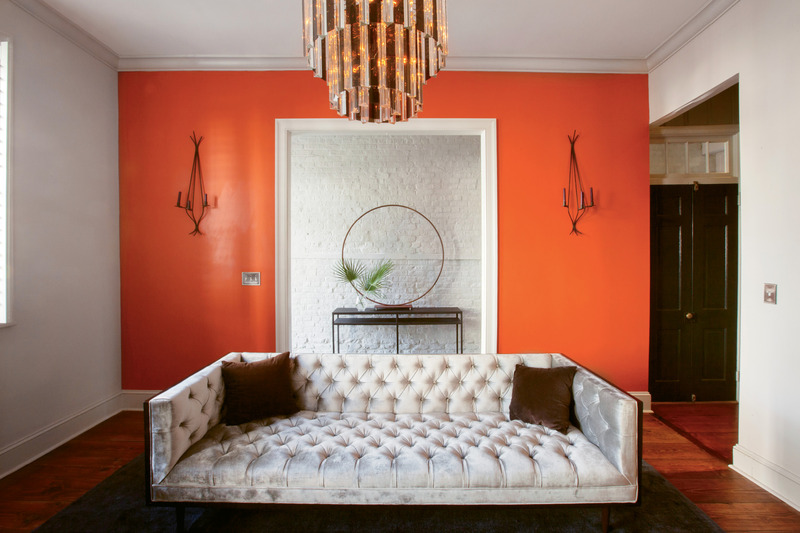 A bold accent wall In Benjamin Moore’s “Fire Dance” enlivens the living room . Paint It Black: In the dining room, Naylor had the idea to transform the fireplace surround and adjacent built-ins with a few coats of black paint. A wall of succulents in terra-cotta pots and a John Duckworth photograph of the old Morris Sokol building pop against the moody backdrop. Now We’re Cooking: Like many historical homes, the kitchen was originally separate from the main residence; a previous owner linked the two structures and added 21st-century comforts. 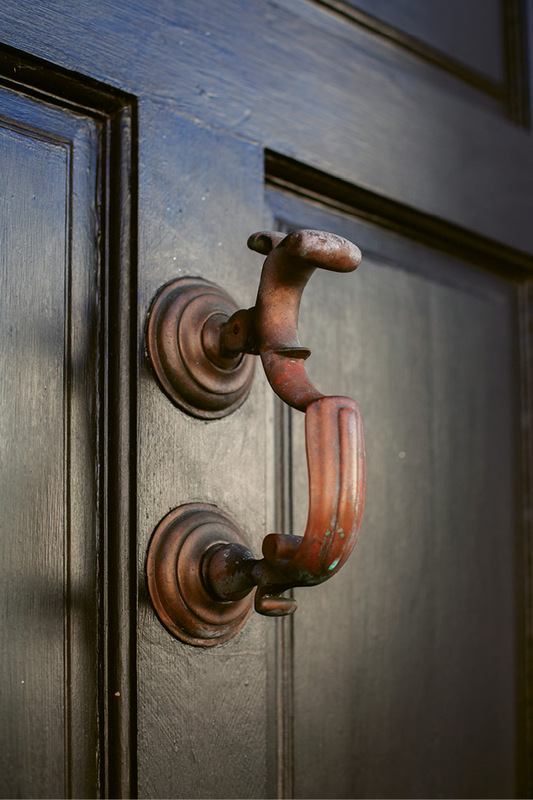 A physician’s knocker, a style once used to identify the home of a doctor, graces the front door. Inside, visitors are met with an antique carriage wheel; the sculptural metal object by stylist and artist Nathalie Naylor could easily be mistaken for a work of modern art. 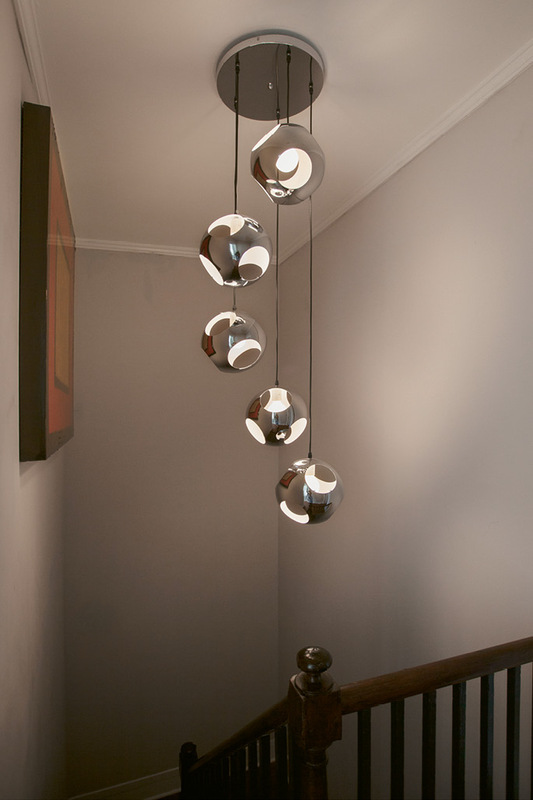 Naylor found the chandelier that illuminates the stairwell on eBay. In the dressing room, a playful piece by Parisian artist Samar Hamis and textiles co-mingle with traditional silhouettes. 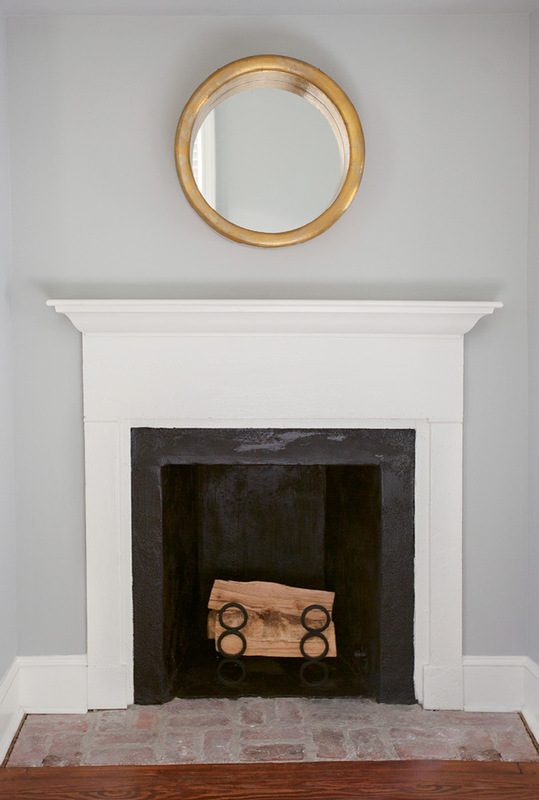 A perfectly simple gilded mirror from Antiques of South Windermere hangs above the fireplace mantel in the guest room. 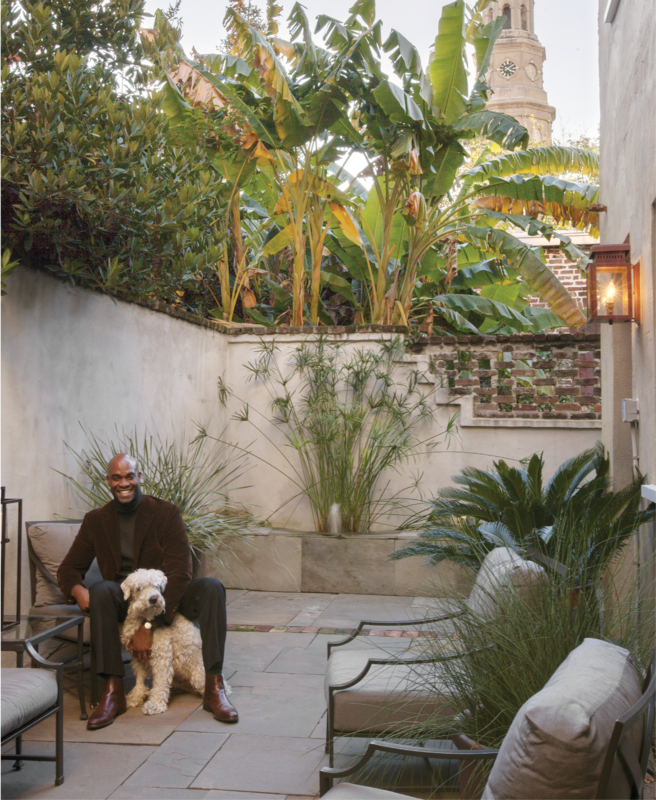 Green Room: Irions says his private courtyard, which boasts a view of the steeple of St. Philip’s Church, is like another room of the house. “I am very proud to be a new member of this community and so grateful to call Charleston home,” he says. PHOTO - When Eddie Irions came to town for a stint at MUSC, he didn’t plan to stay. But the doctor, who usually opts for all things modern, fell hard for the historic city—and more specifically, this 18th-century abode with its epic view of St. Philip’s steeple. In matters of the heart, they say opposites attract—and Eddie Irions is proof that the old adage can be applied to house-hunting, too. The Memphis-born gastroenterologist is drawn to bold colors and modern silhouettes. But when he laid eyes on the 19th-century stucco-over-brick home where he now resides with his Wheaten terrier, Kasey, it was love at first sight. Much of the French Quarter residence’s allure was its location in the heart of one of downtown’s most charming neighborhoods. After studying medicine in Atlanta and New York, Irions landed at MUSC to finish his training. It was meant to be a temporary stint, but the doc fell hard for the Holy City. In some ways, it reminded him of his Tennessee upbringing. “I’m a true Southerner despite the fact that I talk too fast at times,” he laughs. It appealed to the city-dweller in him, too. “Charleston has a very strong pulse: the restaurant scene is fantastic, the quality of life is unmatched. I wanted to be in the middle of things here, just as I was in New York.” He soon found himself scrapping plans to return to the Northeast and instead searching for a place on the peninsula to live. As he explored the city, his appreciation for its historical architecture grew. One afternoon, while cruising around on his bike, Irions noticed a three-story, circa-1821 building for sale and arranged a tour. Before even crossing the threshold, a special detail caught his eye: the front door was outfitted with a brass physician’s knocker, a style of hardware once used to identify the homes of doctors. “I thought that was a cool coincidence,” he says, adding that the knocker is thought to have belonged to Dr. Joe C. Chambers, an area doctor and health department official, who lived there in the 1970s. There was much else to love about the structure, which had served as a three-unit apartment building many decades ago. 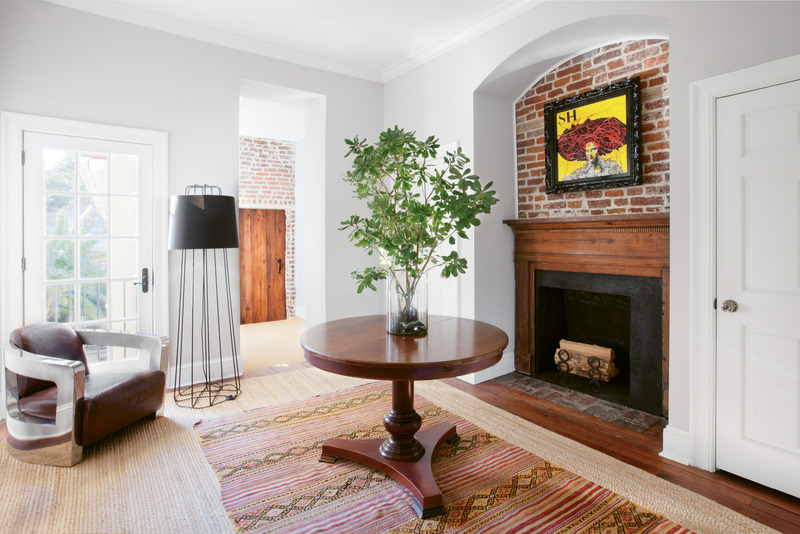 In the foyer, a wall of exposed brick and tabby mortar, believed to be original to the home, adds texture as well as history. In the rear, the iconic steeple of St. Philip’s Church presides over a lushly landscaped courtyard. And though it’s nearly two centuries old, the home is well-suited for 21st-century living: Over the course of multiple renovation projects, previous owners updated the plumbing and electrical systems and connected the once-separate kitchen to the main house. Irions took the plunge and bought the place in 2011, but several years went by before he was ready to put his stamp on the interiors. “I err on the side of modernism, but this isn’t an apartment in Miami; it’s a 19th-century home in the French Quarter of Charleston,” he says. 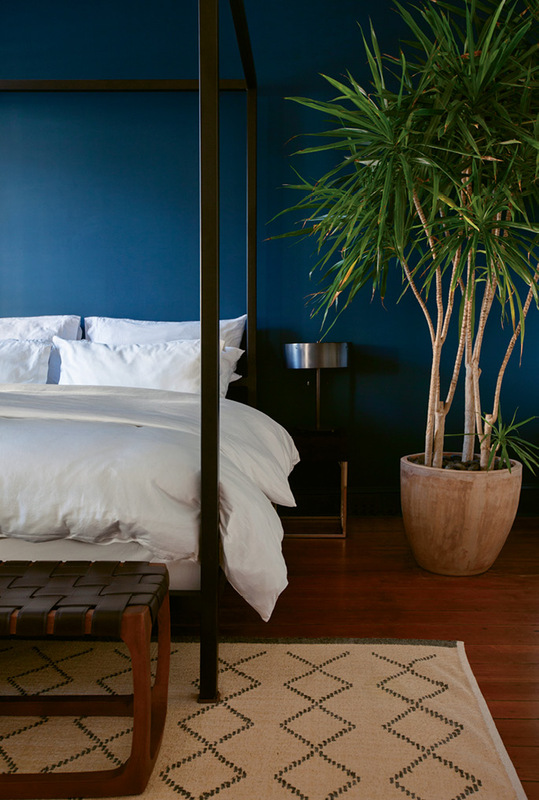 “Respecting that needed to be kept in mind at all times.” Still, he wanted the house to reflect his taste, and so in 2014, he enlisted Sullivan’s Island-based stylist Nathalie Naylor to help him curate furnishings and decor that would complement, rather than compete with, the architecture. In regards to selecting colors, the palette throughout is mostly muted. “It’s very classical, white and grey, with some bold accent walls,” Naylor notes. Against a neutral backdrop, those bright notes shine without overpowering. 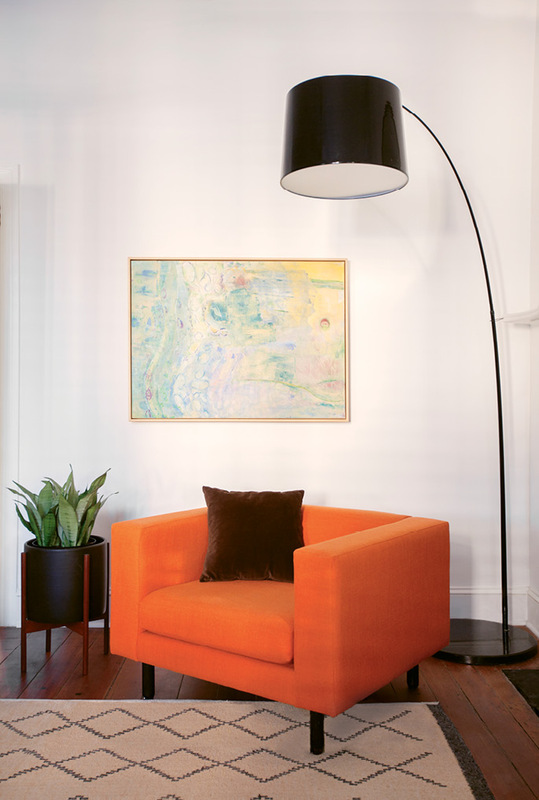 In the living room, for example, an orange wall and a colorful oversize portrait by Brazilian artist Robson Reis Marques are tempered by white walls, neutral furnishings, and a solid black rug. In the dining room, Naylor had the fireplace surround and adjacent built-ins painted black. Rows of succulents in terra-cotta pots and a piece by local artist John Duckworth provide contrast and visual interest. 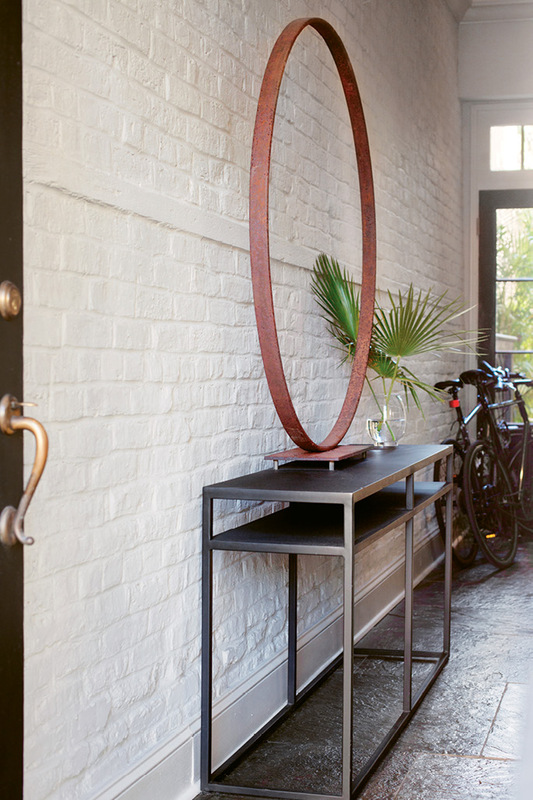 With his abode thus furnished, Irions feels he’s finally living in a place that reflects his personality—and he’s stoked to be so close to the action at the heart of his adopted city. Nowhere is this clearer than in the carriage house-style scullery, his favorite perch when working from home. 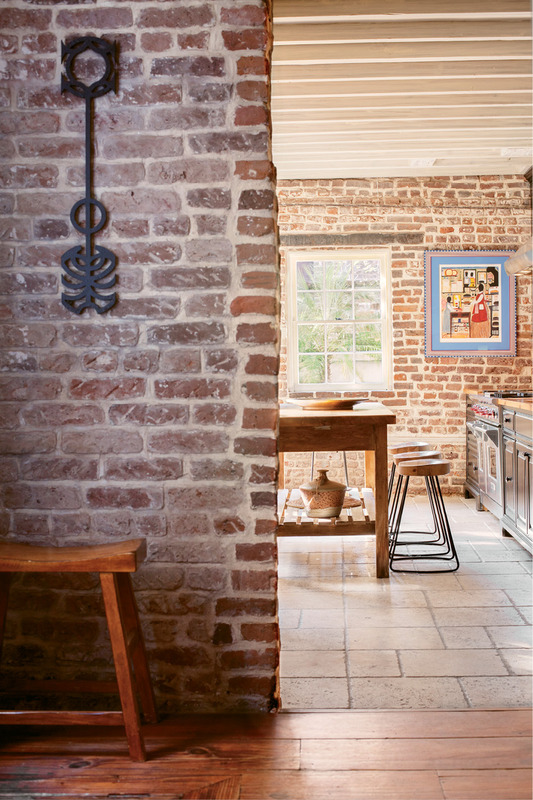 Though he admits he’s not much of a chef: “I think I may have the cleanest kitchen in Charleston because I rarely use it. My friends made it clear it’s best I don’t try to cook,” he jokes. Otherwise, he’s very productive at the kitchen table.